There has been a lot of talk about blockchain and IoT revolutionizing the supply chain, but robotic process automation could be the next big thing. Data entry — it’s one of the least interesting tasks in any industry. But what if it, and similarly repetitive tasks, can be automated? This is the question that robotic processing automation (RPA) seeks to answer. Freeing up employees to do jobs that require “the human touch” is a clear advantage of RPA, as are speed and efficiency. The benefits of robotic process automation are so enticing that a 2017 Information Services Group study estimated that by 2019, 72 percent of companies will employ RPA for support functions. The 28 percent lagging on adopting RPA may want to reconsider. RPA uses machine learning to automate task-oriented jobs in the workplace, including processing claims, analyzing data, and completing order forms. Bots completing these tasks eliminate keyboarding errors, analyze data more quickly, and communicate more efficiently with other systems. Robotic process automation works with the software within an ERP system, where it has been configured to analyze and manipulate data while processing orders. Bots deployed by the RPA complete jobs that can be performed using structured inputs and logic. Similar bots — like chatbots responding to help questions on websites — are nothing new, but the confluence of computer vision, optical character recognition (OCR), natural language processing, and speech recognition has drastically increased the uses of such automation. Typically, when those working in the supply chain hear the terms “robotic” or “automation,” they immediately picture physical robots working on the floor in factories and warehouses. However, robotic process automation is largely invisible outside of the software. RPA, in its current form, is best-suited for back office jobs where it can automate administrative duties. Transactional business functions like offering a quote and entering data for an order no longer tie up human workers and can be done error-free, at any time. In many industries, when automation is adopted, customer service takes a hit. However, when applied in supply chain management, RPA increases efficiency while allowing employees to step away from administrative duties and focus on building client relationships, solving more complex problems, and sharing in-depth knowledge of products and processes. Aside from eliminating costly errors and increasing efficiency, one of the most enticing aspects of robotic process automation is its scalability. Based on the amount of work needed, more bots can be deployed, assuring that there is a big enough workforce and consistent quality, even during the busiest times. As with most technology, RPA becomes a source of massive amounts of data which can be used to optimize a business. Information about customers’ orders can help the sales team know when to reach out and remind them to reorder and help other staff manage inventory to make sure the warehouse is fully stocked at the right time. This allows for quicker order fulfillment and an accelerated order-to-cash cycle. Robotic process automation has already been adopted by some of the biggest companies in the world, including Walgreens, Walmart, AT&T, Anthem, and more. While their success and the cost- and time-saving benefits of RPA are undeniable, there are still some things for companies of any size to consider before committing to the transition. One of the chief concerns when switching to any form of automation is the human impact. Talk of automation creates fear of lost jobs for many whose positions will be affected. It’s vital to keep employees and HR in the loop and to explain that RPA is designed to reduce the amount of monotonous tasks — freeing humans up for more interesting and important work, not replacing them. Of course, one of the best ways to seamlessly implement robotic process automation is by getting the IT department involved right from the beginning. This helps make sure all the appropriate resources are available and is a good way to proactively avoid potential roadblocks. It’s also important to set realistic expectations of what the implementation of RPA aims to accomplish. Sure, it will improve efficiency, but what are the other desirable outcomes? Answering this question helps design a successful operating model and assists in choosing the right provider for the service. The anticipated near-universal acceptance of RPA is being met with an abundance of vendors willing and able to offer the service. Deciding which is the right partner ultimately depends on an individual company’s needs. One of the front-runners in the field is Blue Prism, whose RPA is being used by Walgreens. Its interface is a little more suited for programmers but includes a virtual desktop for increased security. Another leader in the field, EdgeVerve, has drag-and-drop features and bots with machine vision that allows them to complete tasks on PDFs and similar documents. UiPath is an open platform that allows users to create their own bots using a studio that is familiar to users of Workflow Foundation by Microsoft. User-designed bots may need some employee assistance, but UiPath also features others that are ready to operate on large-scale tasks independently. As robotic process automation continues to be adopted by more and more businesses across all industries, the technology will be further refined. 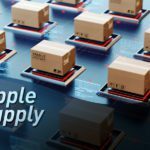 The uses of the technology in the supply chain are just starting to emerge, but it is already proving to be an effective way of cutting costs and increasing workplace efficiency — it will be fascinating to see where it ultimately leads.